More energy is provided by the sun in one hour than the world’s inhabitants are able to consume in a whole year. Solar thermal technology (sometimes called solar water heating) harnesses this powerful, clean, inexhaustible and free resource by converting energy from the sun into hot water for buildings of all types. It is also ideal for businesses and organizations wanting to reduce their carbon emissions and protect themselves from the potential of rising fuel costs. Solar thermal is fairly well established in the United States, it remains an under exploited technology in other countries. What’s more, compared with other renewable energy technologies, solar thermal is a relatively inexpensive way of generating hot water. The links on the left give you all the information you need to help you make the decision on whether solar thermal is right for you. On this page we provide some information on the various pages contained in the Solar Thermal section. It is thought that this technology was first invented in 1896 in the United States of America. Simple painted boxes of water that trapped the suns heat energy for use in domestic baths seems to be its origin. Soon after this William Bailey invented the first thermosyphon system; this development meant that hot water could be used day or night and led to the successful commercialisation of solar thermal. Since then Solar thermal technology has come a long a way, improving its efficiency through various means but the general premise hasn’t changed. This section provides detailed information on the different types of solar water heating systems that are available to you. 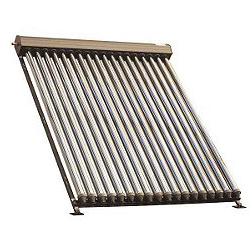 Generally speaking though, there are two main types of solar thermal system: active solar water heaters that rely on electric pumps, valves and controllers to circulate water or other heat transfer fluids through collectors, and passive solar water heaters that do not require pumps to circulate the liquid. Passive systems contain no electrical components so they are generally cheaper, more reliable and easier to maintain. This said they are generally less efficient than active systems. The basic principal of solar thermal heating is to utilize the sun’s energy and convert it into heat which is then transferred into your home or business heating system in the form of hot water and space heating. In most domestic systems, heat energy from the sun raises the temperature of fluids in the collector tubes. This fluid is then pumped to a heat exchanger which is inside the water tank in your property. The heat is exchanged through thermal convection to the water in the tank and the fluid is pumped back round to be heated again in the tubes. The most common way to install solar thermal collectors is to mount them directly onto your property’s rafters using specialist roof hooks, mounting frames and clamps. If your property has more than one story, you may need to hire scaffolding (at an extra expense) in order to gain roof access, though compared with PV arrays, solar thermal systems are relatively small and light, so this is not always necessary. The price of a solar thermal system will vary considerably based on a number of factors, not least which state in the US you live in. In most areas, however, it is a popular source of low cost water heating and has a number of incentives at a state level to support it. The potential savings offered by solar thermal systems are difficult to calculate exactly and depend on a large range of factors. This section provides the details of how much you can expect to save on your energy bills after installing a solar thermal system. Information on the financial benefits and current government incentives can be found on the Financial Benefits pages. When combined, this information will help you work out your pay-back period and the potential financial worth of your proposed system. How will owning a Solar Thermal system affect the value of my property? There is still little conclusive evidence to suggest that the presence of a solar thermal system impacts positively or negatively on a property’s value. However, the ability to produce hot water in a cheap and environmentally friendly manner and receive rebates for doing so is bound to be attractive to potential buyers. Is my property suitable for Solar Thermal panels? When considering whether or not to procure a solar thermal system you will need to consider the proposed system’s site location, the property’s location in the country, roof tilt and orientation, and any possible shade from direct sunlight. This section will help you decide whether or not your proposed site is suitable. It is a very common practice to integrate solar thermal panel technology into existing water heating systems. You will be able to use all of the existing radiators and pipework, though in some cases it may be necessary to buy or use an existing boiler to accommodate the solar thermal system. However, integrating a solar thermal system with a combi-boiler system may prove problematic in some cases. Find out more by clicking on the header or the tab on the left. There have been many studies that have been undertaken attempting to ascertain the true value of solar thermal technology to our environment, lifestyle and finances. All of which have come to the conclusion that the technology, over time, has a positive effect on all three. This section looks at the impact the technology has on the environment from its manufacture to the end of its proposed lifespan. Solar thermal systems are an ideal solution for heating swimming pools. Generally they are both more efficient and cost effective than other heating methods. The cost of heating a swimming pool by traditional means is becoming ever more expensive as the boilers and fuels that are normally used are less efficient and are going up in cost. If you are considering heating systems for your swimming pool then this is essential reading for you. This section gives you information on getting your solar thermal installed, including a detailed step by step breakdown of the installation process. It is possible to install one’s own solar thermal system, and one can buy kits which contain all the necessary components which cost between $2,000 and $6,000 - significantly less than it would cost to hire an accredited installation company. It is also possible to take courses which will teach you how to install solar technology. As the price of conventional fuels rises rapidly and as the technology becomes more affordable and accessible to the mass market, more and more people are turning to renewable energy solutions to provide environmentally friendly heating and electricity for their homes and businesses. Before deciding to install a solar thermal system, it is vital to consider a wide range of factors. Most solar thermal systems are ideal for domestic use, though if you are a business or organisation that uses large amounts of hot water (such as restaurants, hotels, schools, hospitals etc. ), solar thermal may also be suitable. It is also possible for communities to install communal solar thermal systems. This section will help you evaluate your proposed system’s ‘worth’.